UNIVERSAL CITY, Calif., Dec. 13, 2018 — (PRNewswire) — The truth cannot be converted in the powerful and thought-provoking film Boy Erased, arriving on Digital and the digital movie app MOVIES ANYWHERE on January 15, 2019 and on Blu-rayTM, DVD and On Demand on January 29, 2019 from Universal Pictures Home Entertainment. Based on the incredible true story of Garrard Conley and his compelling book Boy Erased: A Memoir, critics are calling the film "one of the very best pictures of the year" (Scott Mantz, Collider) and admiring the exceptionally raw and passionate performances from Academy Award® nominee Lucas Hedges (Manchester By the Sea) and Academy Award® winners Nicole Kidman (Lion) and Russell Crowe (Les Misérables). 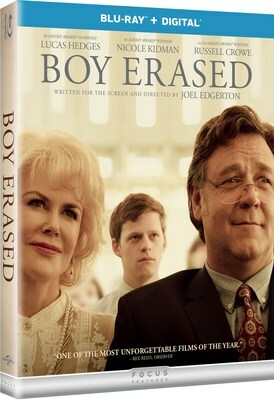 The critically acclaimed Boy Erased received two Golden Globe® nominations including Best Actor in a Motion Picture and Best Original Song for "Revelation" by actor/singer-songwriter Troye Sivan and musician Jónsi. Beautifully written and brilliantly executed, Boy Erased also stars Golden Globe®-nominated actor Joel Edgerton (Loving) who lent his talents as director, writer and producer as well as an exceptional supporting cast including Joe Alwyn (Operation Finale), Xavier Dolan (Bad Times at the El Royale), Troye Sivan (X-Men Origins: Wolverine) Cherry Jones ("Transparent") and Flea (Baby Driver). This is the courageous story of Jared Eamons (Hedges), the son of a Baptist pastor in a small American town, who must overcome the fallout of being outed to his parents (Kidman and Crowe). His parents struggle with reconciling their love for their son with their beliefs. Fearing a loss of family, friends and community, Jared is pressured into attending a conversion therapy program. While there, Jared comes into conflict with its leader (Edgerton) and begins his journey to finding his own voice and accepting his true self. An uplifting story of acceptance, Boy Erased on Blu-ray™, DVD and Digital comes packed with special bonus features that explore the film's important messages and its relevance in today's cultural conversation, taking audiences deeper into the inspiring coming-of-age tale. Jared Revealed – A sit down with actor Lucas Hedges and Garrard Conley, upon which the story is based, to trace the maturation of Jared's character and how the film's depictions and the true events of Garrard's life carefully align. Becoming the Eamons – As Jared's parents, Nicole Kidman's tender turn as his mother Nancy and Russell Crowe's brutal depiction as Marshall, we are introduced to the characters who have impacted Jared's life the most. Man Consumed: Joel Edgerton – Cast and crew examine how director, writer, and actor Joel Edgerton immersed himself in all aspects of the production to adapt a film equally as beautiful and poignant as the novel upon which it is based. Boy Erased will be available on Blu-ray™, DVD and Digital. Produced By: Kerry Kohansky-Roberts, p.g.a., Steve Golin, p.g.a., Joel Edgerton, p.g.a. Rating: Rated R for sexual content including an assault, some language and brief drug use. Universal Pictures Home Entertainment (UPHE – www.uphe.com ) is a unit of Universal Filmed Entertainment Group (UFEG). UFEG produces, acquires, markets and distributes filmed entertainment worldwide in various media formats for theatrical, home entertainment, television and other distribution platforms, as well as consumer products, interactive gaming and live entertainment. The global division includes Universal Pictures, Focus Features, Universal Pictures Home Entertainment, Universal Brand Development, Fandango, DreamWorks Animation Film and Television and Awesomeness. UFEG is part of NBCUniversal, one of the world's leading media and entertainment companies in the development, production and marketing of entertainment, news and information to a global audience. NBCUniversal owns and operates a valuable portfolio of news and entertainment networks, a premier motion picture company, significant television production operations, a leading television stations group, world-renowned theme parks and a suite of leading Internet-based businesses. NBCUniversal is a subsidiary of Comcast Corporation.